The Jewish community in Brooklyn was outraged when they learned that an FDNY Firefighter with a history of being an open anti-semite and racist had been assigned to a Boro Park fire station. Thankfully, that has changed. New York State Assemblyman Dov Hikind (D-Brooklyn) thanked New York City and the FNDY for re-assigning the racist firefighter who had been assigned to a firehouse in his district. His recent assignment to Engine 247 on 60th Street in Borough Park, the heart of Orthodox Jewish Brooklyn, had the Assemblyman and his community both angry and frightened. Hikind had planned a protest at the Firehouse for this Thursday along with a number of Holocaust survivors but cancelled those plans when notified of the reassignment. 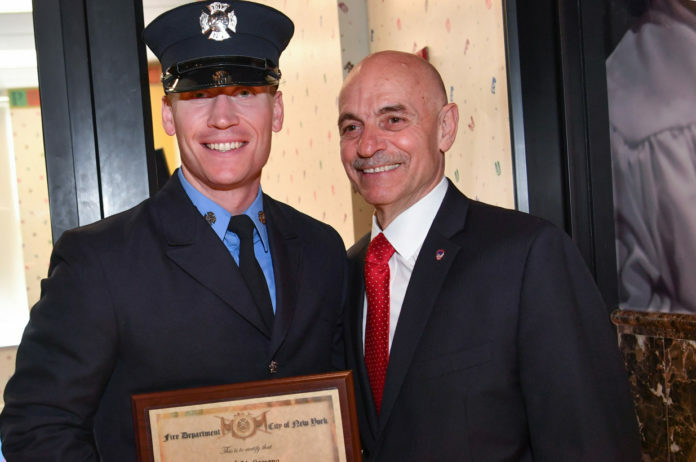 Joseph M. Cassano, 28, the son of former FDNY Commissioner Salvatore Cassano, graduated from the Fire Academy last week and was assigned to Engine 247 on 60th Street. The younger Cassano had resigned his job as an FDNY emergency medical technician in 2013 after Tweeting racist and hateful comments about Blacks and Jews. Sorry Dov I think you making a mountain out of a mole hole. No matter where he ends up at some point he will be interacting with jews in a city like new York. Perhaps sensitivity training or the like would have been better. I am proud of Hikind. Mr Hikind always goes out of his way for his fellow Jews! He should be applauded!! I give him a standing ovation !! Time and time again he has proven himself!! It’s shocking that an openly racist and Anti-Semitic dog like this can actually remain an employee of NYC in 2018. All you Hikind haters- just because you got new politicians and forgot all the good he did for your communities, that doesn’t mean all he does is bad! Kefuyai Tova! Good PR for the elected official. Let’s just be happy and appreciative that Hikind is responding to the requests and needs of the community. Seriously,people?? A person spewing such racist comments does not belong in the FDNY! Good job,Dov! Yes most people in boro park dont interact with firefighters daily but if god forbid we need them is this the man u expect to rescue ur family?? How come I don’t see Reb Dovid F. מחאה? BH Hikind responds to his community’s concerns. If he can’t stop this racist and anti semite join the NYFD at least he isn’t in our face. Hikind did what was necessary and it worked. My question is WHERE were your other heimisha reresentatives? I give you a brocho that you should NEVER EVER NEED any of Hikind’s help.